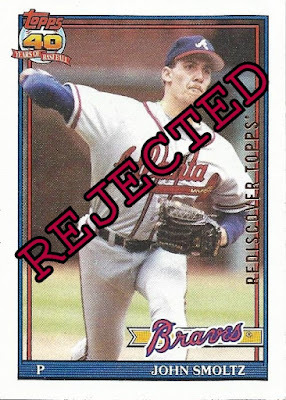 Last year I did something that I've typically avoided during my time in this hobby, and took a shot on a somewhat expensive redemption card. I really didn't like the concept of "hoping" that the company in question (Upper Deck in this case) would come through with the promised card, but the redemption was for a card that I wanted badly and would have precious few chances to land so I went for it. In the end it worked out quite well, as Upper Deck supplied the promised card and this sweet Jagr buyback auto became one of my best additions of 2017. Since I had a positive outcome last year I decided to roll the dice again here in 2018 with another redemption from this same release. This particular card is one I wanted as badly or maybe even more so than the Jagr. In fact, I saved an eBay search for it months before I even knew whether it existed or not. After a good long wait, and a couple of missed opportunities, I ended up winning the redemption card on eBay. When it arrived I dutifully scratched and plugged my code in at Upper Deck's website. I fully expected to see some sort of message that the card would ship soon, as the other examples I'd lost out on were the actual, redeemed card. You can imagine my surprise when I was greeted with "the athlete has committed to signing soon, thank you for your patience". Another few weeks passed, and then one day I found a FedEx label stuck to my front door with the signature required box checked. 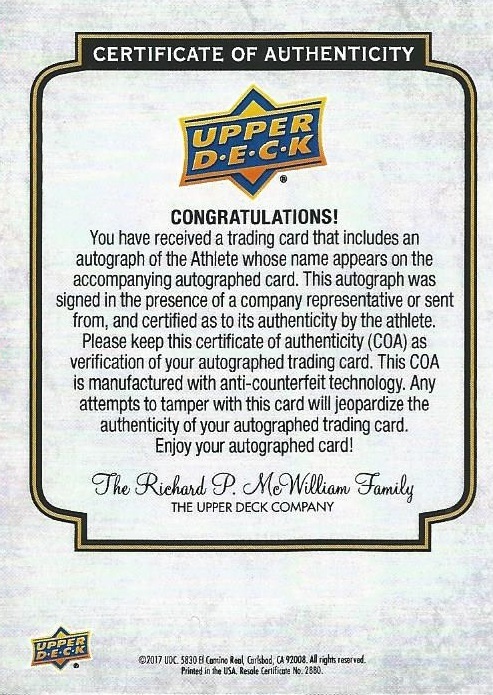 The sender was The Upper Deck Company; my card was here. Behold! Ain't she a beaut'? 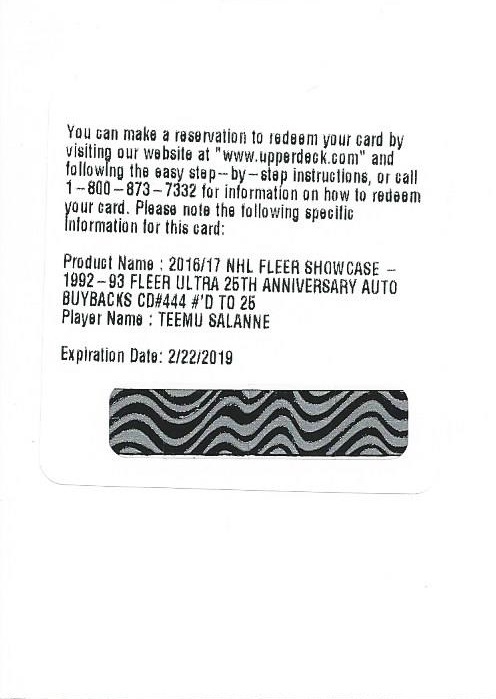 I love that Teemu went big and bold with the signature, looks great! The second I heard that there were '92-93 Ultra buybacks included in the 2016-17 Fleer Showcase release I immediately thought of this card. 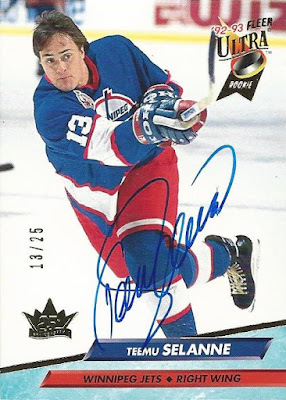 I was a rabid 10-year-old hockey player and fan when Selanne burst onto the scene and recorded 76 goals (a rookie record that still stands and may never be broken) and 132 points in 1992-93 with the Jets. He was right up there with Eric Lindros in terms of guys with tremendous hobby buzz who could potentially take the torch from the Gretzkys and Lemieuxs of the world. Collectors were crazy for both players, and I spent many hours trying to emulate them at the rink, and with my street hockey stick and net in the back yard. 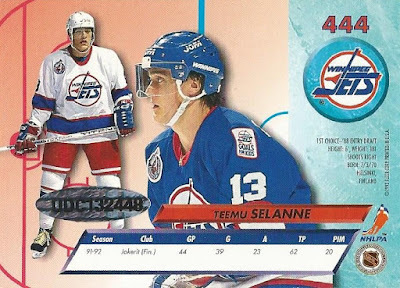 While Teemu did have a card in the 1991-92 Upper Deck set, he was depicted with team Finland on that one. 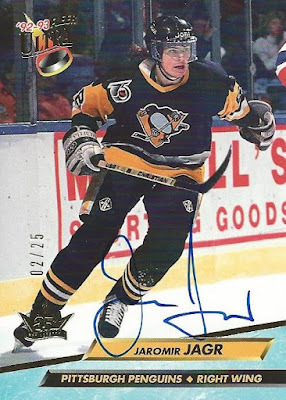 Besides, since he didn't debut in the NHL until the '92-93 season I always considered this Ultra card and his '92-93 Upper Deck card to be his true rookies. I love the post-shot follow through photo on this card, and of course the iconic (for those of us who are children of the '90s anyway) gold foil ROOKIE ribbon affixed to the Ultra logo is the icing on the cake. 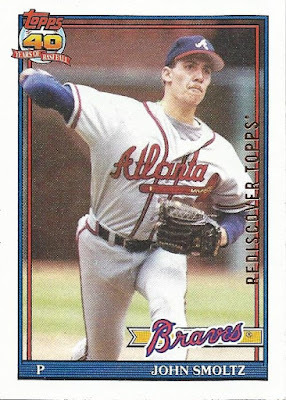 '92-93 Ultra is one of those rare sets where the design of the back of the card is so good that I feel compelled to show them every time. Nice that you get a look at both the home and away Jets sweaters here as well. The sticker on the back of the card is matched by serial number to the CoA, which as I've said before is nice with a card of this magnitude. 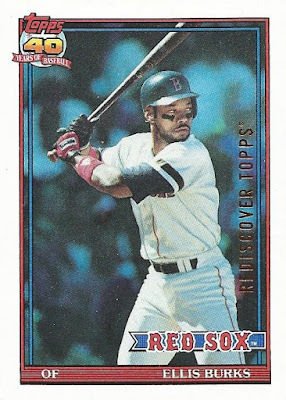 This card seems to be very highly coveted on the secondary market, which is no surprise. 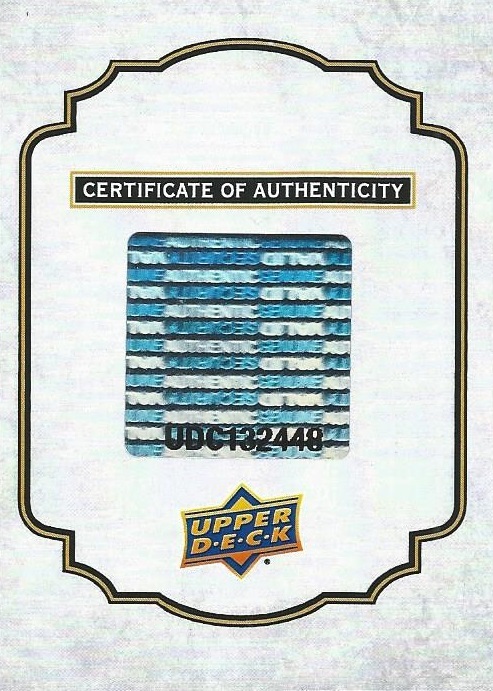 Getting a redemption really paid off here, as I haven't seen any of the live cards fetch below triple digits on eBay, and the last two that surfaced sold for almost exactly twice what I paid for mine. 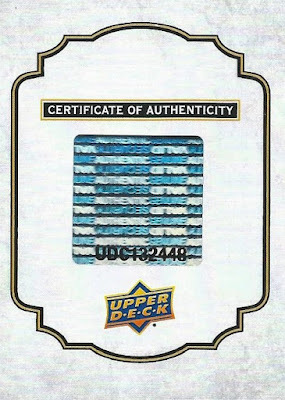 Admittedly it's a very small sample size, but I couldn't be more pleased with my redemption experience with Upper Deck to date. I'm not exaggerating when I say that this is one of my single favorite pickups in the entire 10+ years since I got back into the hobby. I never thought I'd be fortunate enough to have an autograph of The Finnish Flash at all, but to have the HOFer, 600-goal scorer and Stanley Cup champion's John Hancock on this particular card is just awesome. 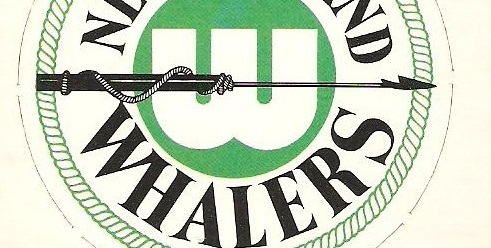 Like the Jagr, I smile every time I look at it. I always told myself that in the future if my priorities or interests changed and I decided to sell off my collection, I'd keep a small box (a shoebox, of course) with a select few favorites to remember my second run in the hobby. 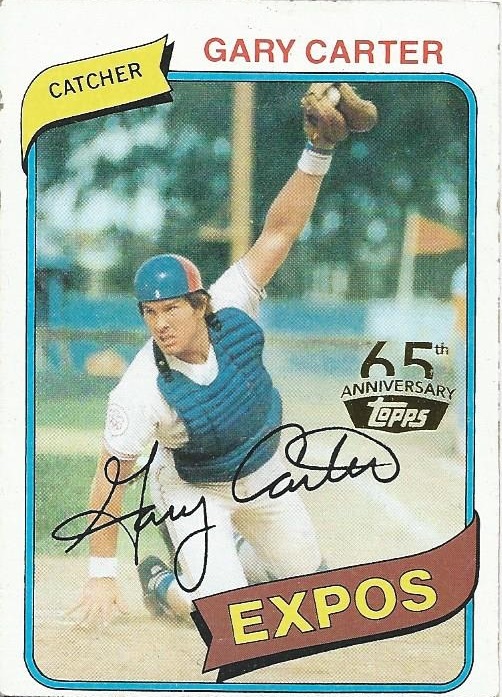 This card would, without a doubt, have a spot in that box. 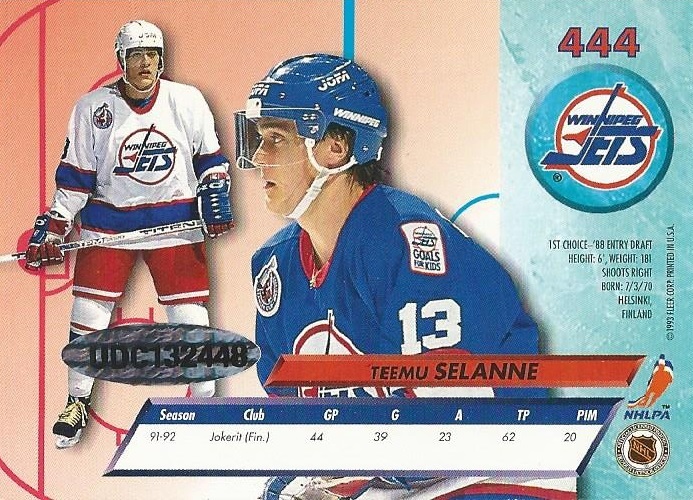 Are you old enough to remember Selanne's breakout season in 1992-93? Can you think of anyone else who has generated that much hype in their rookie campaign since? Sidney Crosby? Connor McDavid maybe? 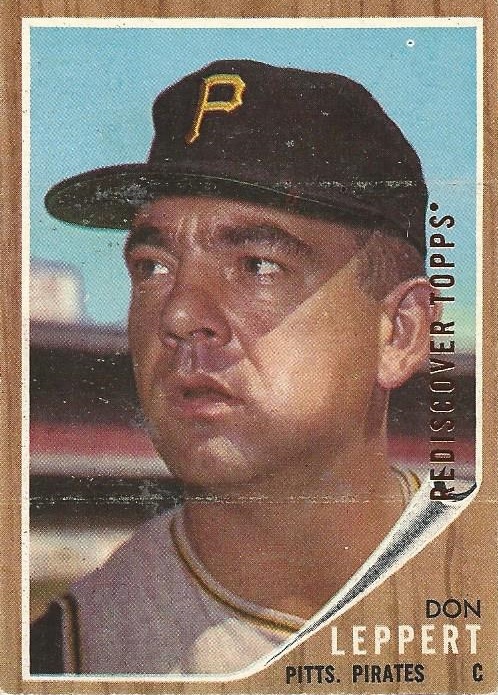 Some noticeable surface crease marks on this '62 Don Leppert, but it's still a nice card. 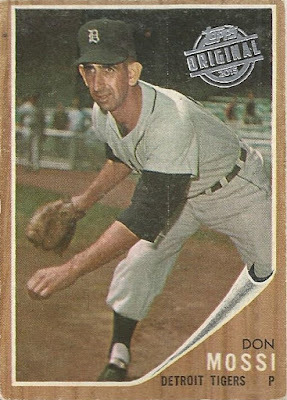 I don't know much about Don, but I do know that 1962 Topps doesn't have a lot of representation within the franken-set binder currently. This '75 Joe Lovitto already sits in slot 36. 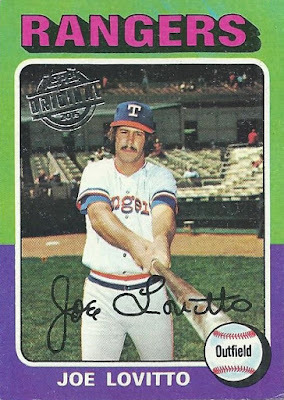 Not exactly a superstar either, but I've always liked the fact that it looks like Joe is swatting at the baseball in the lower right corner that Topps uses to designate position. I could really flip a coin here, but decided at the end of the day that the Leppert just wasn't compelling enough to unseat Lovitto. 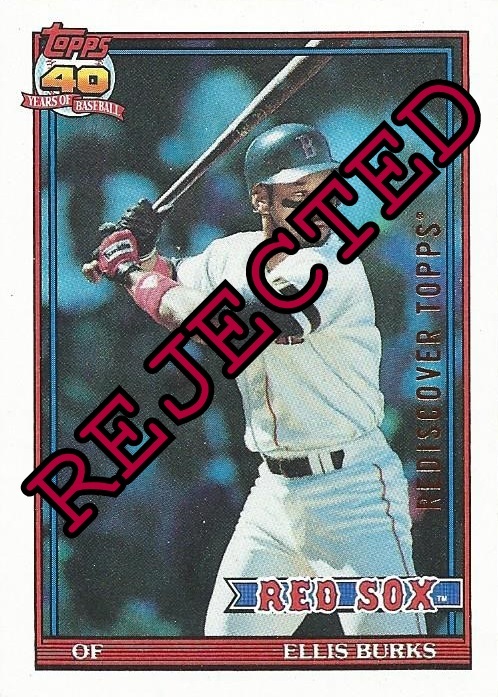 I grabbed this one for obvious reasons, figured I'd fill a hole in the 1990 Topps buyback binder at the very least. As it turned out though, I was lacking a #633 buyback for the franken-set binder, so Dennis Cook will reside there until I can find another 633 to bump him out. At the end of the day I think I paid around 30 cents per buyback that you see in this post, and at that price I just couldn't pass on a HOFer from one of the more under-rated Topps sets from the junk wax era. Of course Smoltz will make the franken-set, I'm not going to shun a guy with a plaque in Cooperstown, am I? Not so fast! 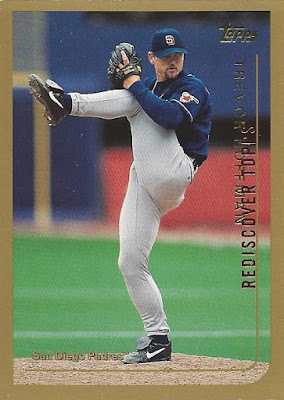 While there's no argument to be had in terms of who had the better career, if we're talking strictly cardboard this Wes Covington blows the Smoltz out of the water! 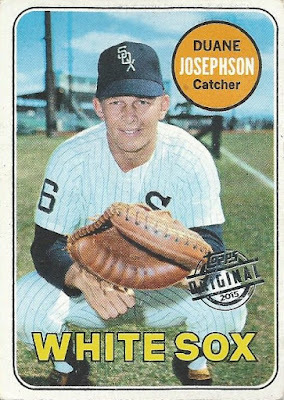 Maybe not quite on a par with Wes' '61 release (which I've never seen in buyback form to this day), but a very solid card nonetheless. Yup, I gotta go with the '60s bat rack photo here. Here's another interesting one, featuring the great Willie McGee catching a pop fly. 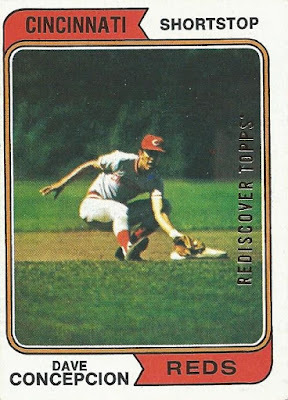 The Wrigley ivy makes it almost impossible to see the REDISCOVER TOPPS stamp along the right edge, but trust me it's there. Will Willie fare any better than Smoltz? 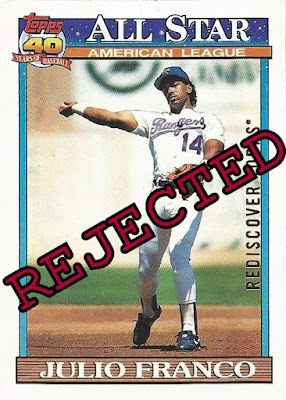 ...but I just can't boot that Concepcion in favor of Willie. 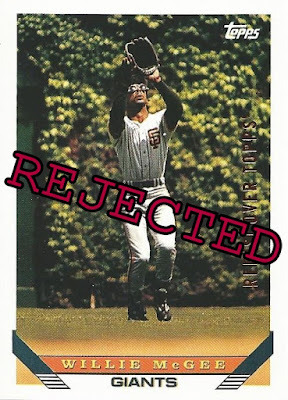 ...and that's exactly what happened, since I already had this great Chico Ruiz in slot 339 of the franken-set. 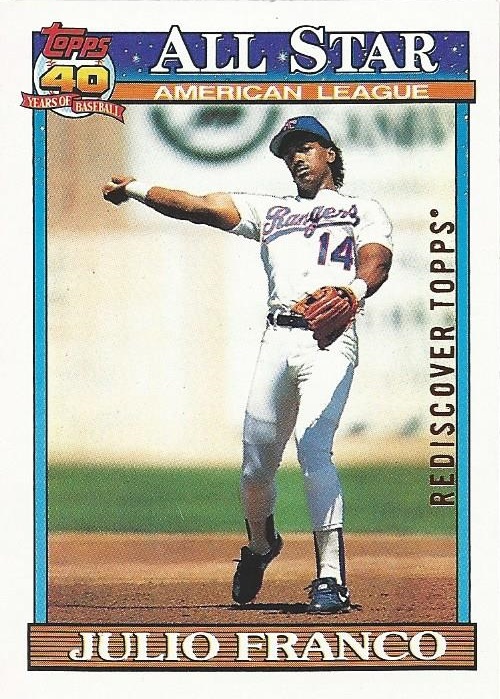 Picked this one up because I've always been a Julio Franco fan. 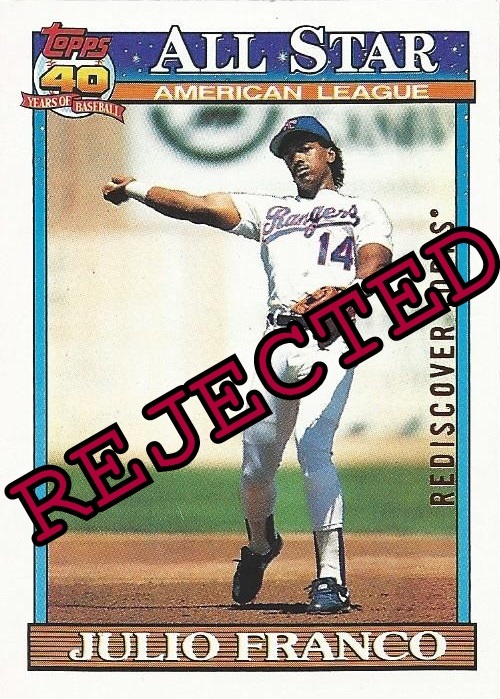 It's hard not to respect a guy who took his final Major League at-bat at the age of 48! 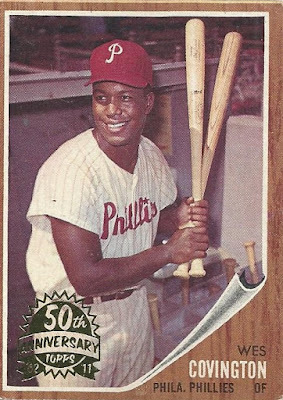 This one was a win/win because, while I'd love to see it make the franken-set, it will still be a solid addition to my small Franco collection absent that. 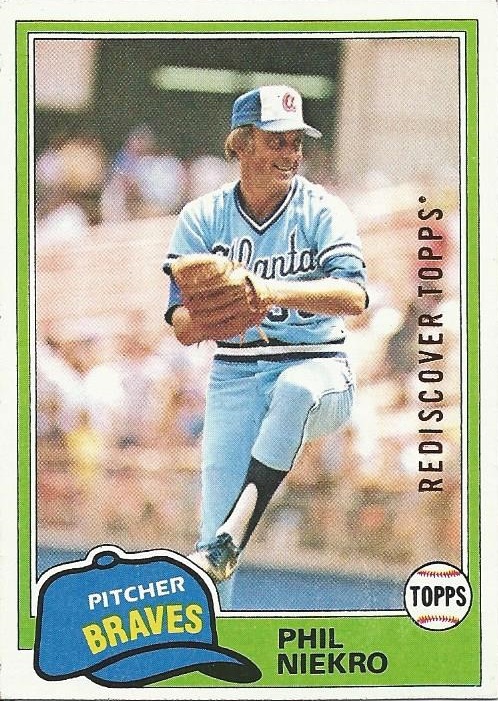 I was not expecting Julio to run up against the buzz-saw that is HOFer Phil Niekro. 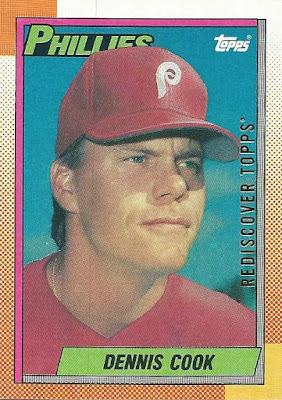 Easy call here with Phil being enshrined in Cooperstown, combined with the fact that I have scant few 1981 Topps buybacks. 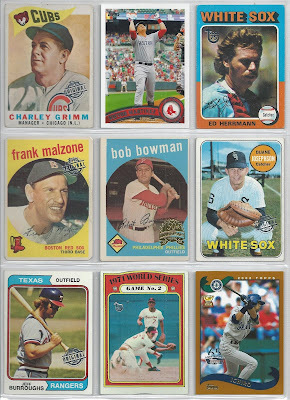 Niekro defends his pocket in the binder! ...as one of my personal favorite buybacks just happens to be a #70. Even as an unabashed Red Sox fan, there was no way I could choose Burks over Carter in that match-up. Easy to see why I snagged this one, as Trevor was finally elected to the Hall of Fame this year. 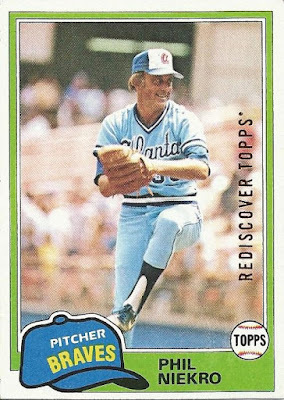 I love the perfectly framed high leg kick here of the closer who was the first to reach both the 500 and 600 save plateaus. A lock for the franken-set, right? Not so fast, Don Mossi and his legendary ears have a thing or two to say about that! 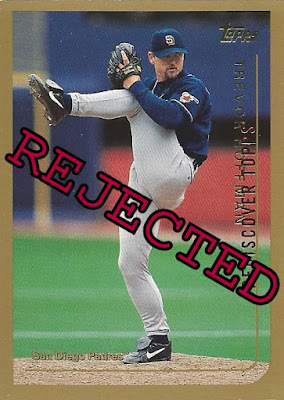 I know the right thing to do is to go with Hoffman here. But my gut is telling me Mossi. 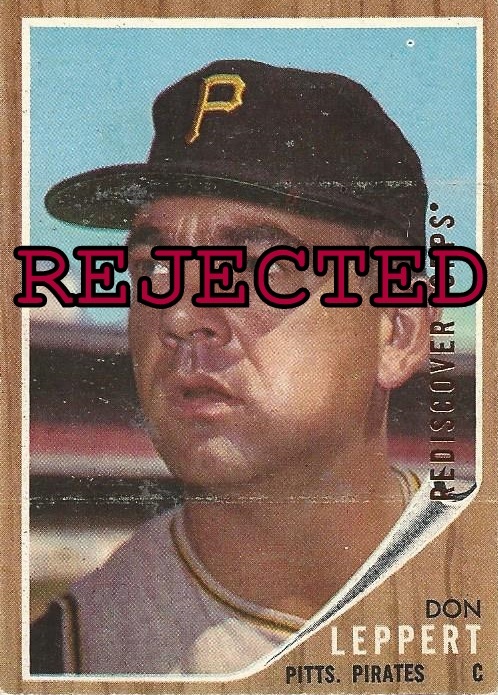 I ruled against a '62 Topps buyback to begin this post, so I'll rule with the '62 here. With that being said, this is one I will seriously consider revisiting someday. How about one last '90 Topps buyback for today? Kurt played in a career-high 144 games in 1990, so there's that I guess. 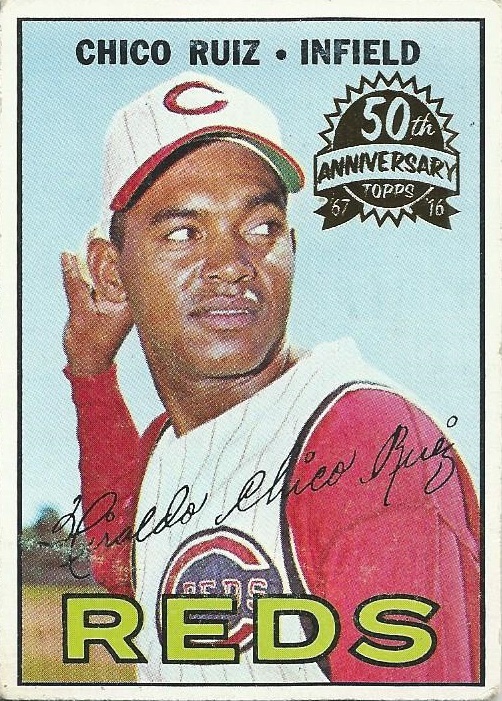 His father also had a brief MLB career with the Senators in the early 1960s. 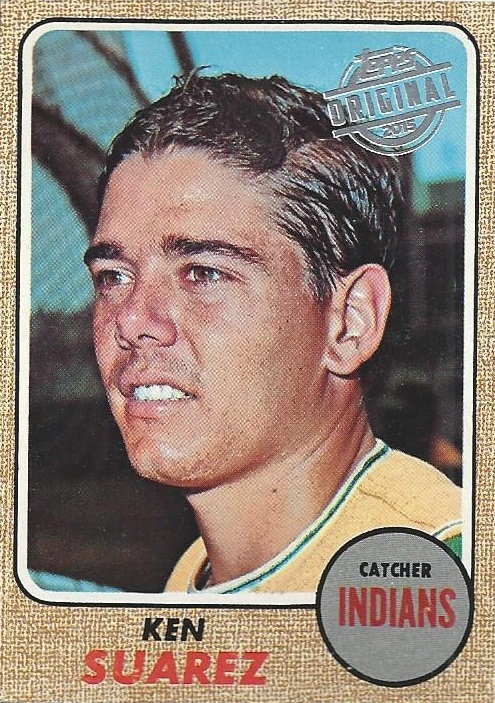 Not a very strong contender for the franken-set here. Easily bested by the buyback that was already in slot 222, this colorful 1969 Duane Josephson. Off to the dedicated 1990 Topps buyback binder with Kurt. Last card for today, and one that I was excited to find in buyback form. 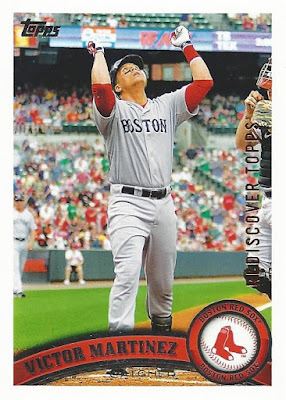 Martinez was solid during his brief tenure in Boston, and I've always enjoyed this home run celebration on his 2011 Topps flagship card. In addition to that, 2011 Topps is probably my favorite flagship set design since I returned to collecting back in 2007. 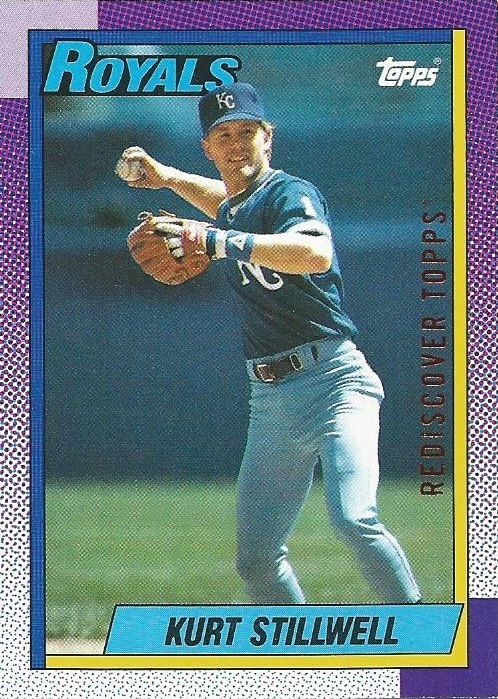 You don't see them in buyback format all that often, since they're not all that old. ...that I'm ousting him in favor of the Martinez. This card was part of a completed page, too. ...and here it is with V-Mart having supplanted him. A solid page indeed! With over 600 different numbers in the binder now it's really getting to be a challenge to find new ones, as is evidenced by today's single new number. Nevertheless, that was a fun grouping and I added some serious star power to the box where I keep my rejects as well. Anyone else been enjoying the World Cup since it kicked off a couple of days ago? I missed the Thursday night opener and the Friday slate due to work obligations, but caught two of the four games yesterday and all three today thanks to the magic of DVR. With the Premier League done for the season it's nice to have some high-stakes international soccer to watch, even if the US didn't qualify. Was running some errands a week or so back and saw these stocked up in my local Target. I had no idea that Panini was doing a Prizm World Cup set for 2018, but I enjoyed their effort from the 2014 World Cup immensely and was excited to discover these. My favorite cards from the 2014 release were the various "wave" refractors, so when I saw that you got three of them guaranteed in this rack pack I was sold. At first I grabbed four of these, figuring they were probably $5 each and I'd spend $20 to make my own blaster of sorts. I happened to ring one through a price checker at the end of an aisle just to make sure though, and I'm glad I did. These are $9.99 each retail! At that price I put three back on the rack and left with just a one-pack sample. Soccer is sort of a second-tier sport for me. I love the game and I watch English Premier League consistently every season, but with baseball and hockey I only have so much time for the sport so I can't keep up with the many other leagues across the globe. 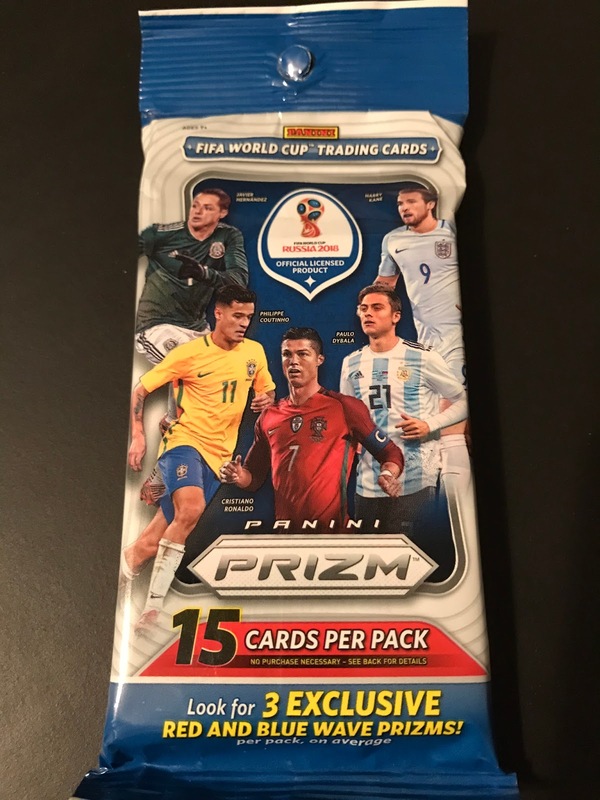 I only mention this to make the point that this pack has serious hit-or-miss potential, as it's entirely possibly I might not recognize a single one of the 15 subjects to be found inside by name. Big smile on my face and a real winner with the very first card out of the pack. Mo Salah was an unstoppable force for my favorite Premier League team, Liverpool, in the 2017-18 season. His 32 goals were good for the Golden Boot (most goals in the league), and were the most scored by a single player in a Premier League season in over 20 years. If you handed me a checklist and asked me to hand-select a single card from this set for my collection it might've been this one. 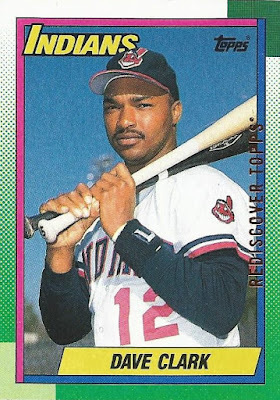 Don't recognize this guy. Looks like he plays club ball in Argentina most recently, the same country he represents internationally. 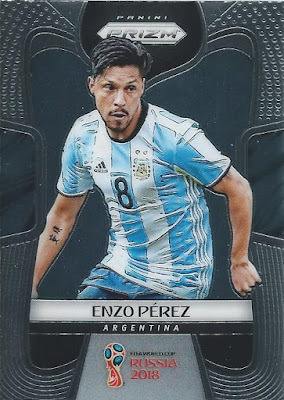 I don't believe he got into the game in Argentina's 1-1 draw against Iceland yesterday. Hey, another guy I actually know! 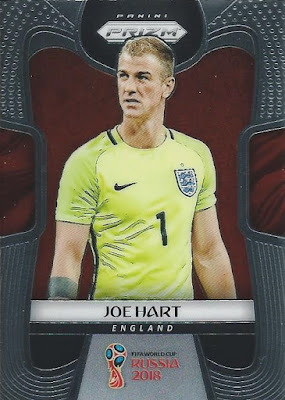 Hart was a longtime keeper for Manchester City in the Premier League, and spent the 2017-18 season on loan to West Ham United. I don't believe he is actually representing England in 2018 here, but I suppose Panini had to settle on the checklist before all the finalized rosters were known. Don't think I've ever seen Leon here play. 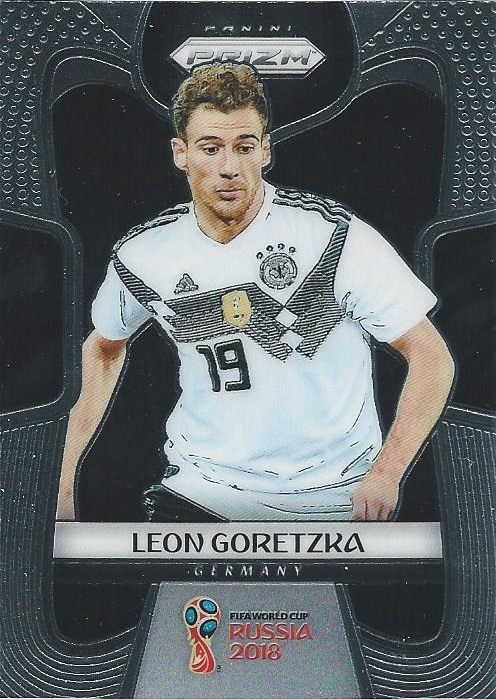 He signed a four-year contract with Bayern Munich earlier this year. 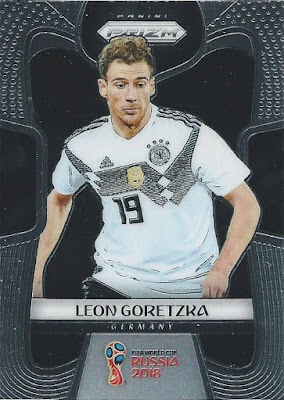 He is with Germany in Russia for the tournament, but didn't see any action in today's 1-0 loss to Mexico. 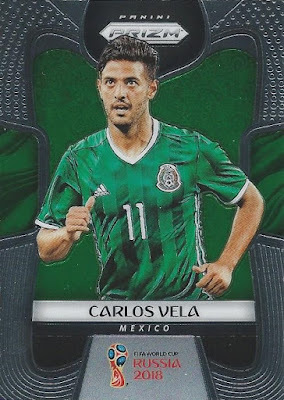 Carlos Vela did play in that game, albeit for the other side. He was subbed for in the second half. 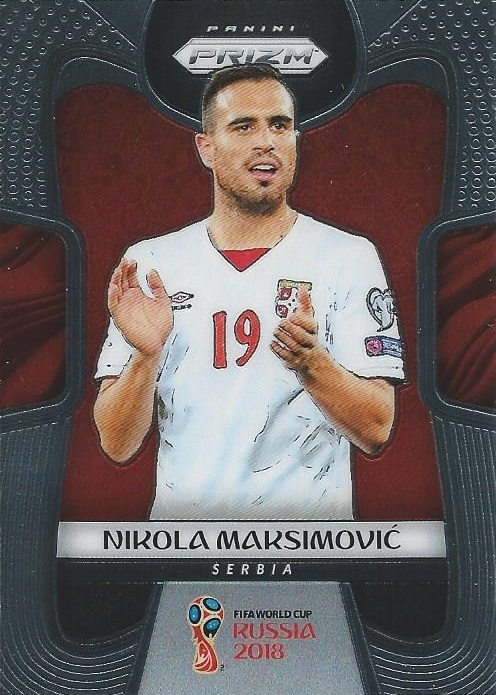 A Serbian national, Maksimovic must feel right at home at this World Cup, given that he played club ball for a team in Moscow on loan this past season. Well, I should say he would've felt right at home, as I don't believe he's actually with team Serbia from what I can tell. 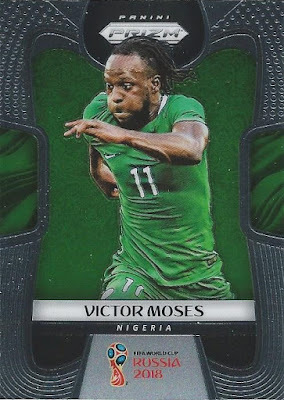 I certainly recognize longtime Premier League player Victor Moses. He played the full 90 minutes in Nigeria's disappointing opening loss to Croatia yesterday. This guy briefly played for Aston Villa in the Premier League years ago, though I'd be lying if I said I recognized him. He was in for the duration of Morocco's opening loss to Iran, and picked up a yellow card. Not a lot of success in the tournament so far for the guys in this pack, but it's still early. 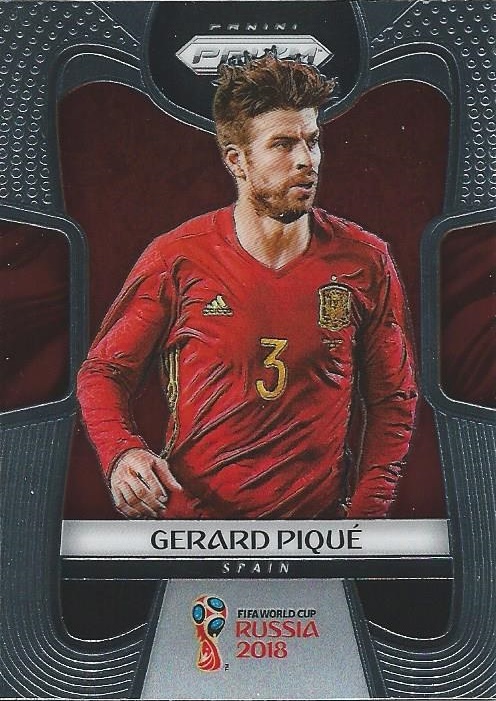 Gerard Pique was on the field for arguably the tourney's most exciting game so far, a 3-3 draw between Spain and Portugal that saw Ronaldo net a hat trick! 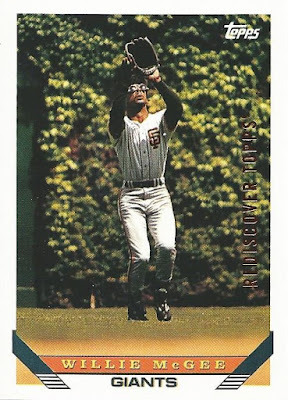 Here's my last base card, another face I recognize well. 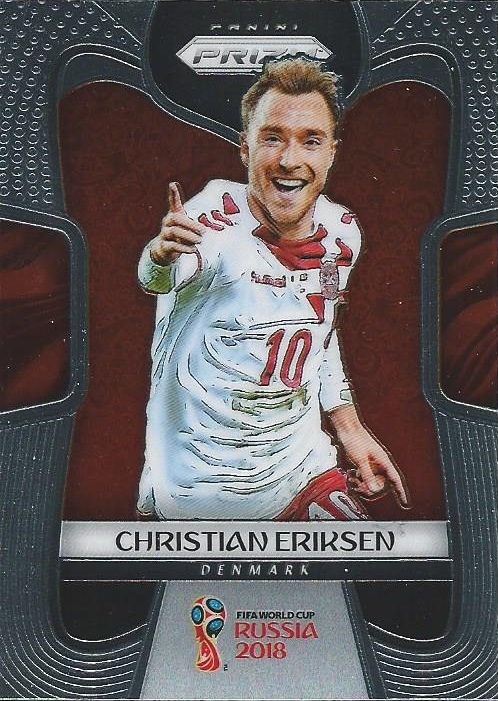 Christian Eriksen has been a major part of the success that Tottenham Hotspur have been enjoying the past few seasons, and he scored 10 times for them in Premier League play this past year. 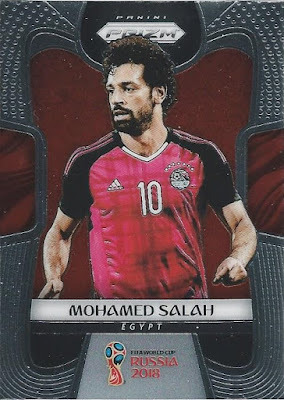 This really was a perfect pack for me, I knew about half of the players and there's no way that average holds true over the entire set based on a quick glance at the checklist. 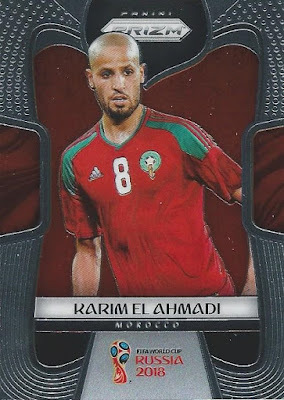 This awesomely shiny bit of cardboard greatness is apparently a "Red Mosaic" parallel. They're not serial-numbered but seem to be at least relatively rare from what I can tell, and I got a recognizable star player to boot! In addition to being a key member of the powerhouse Brazil national team (they have to do better than 2014, right? 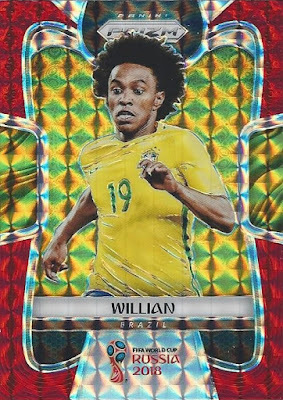 ), Willian is also a star with Chelsea in the Premier League. 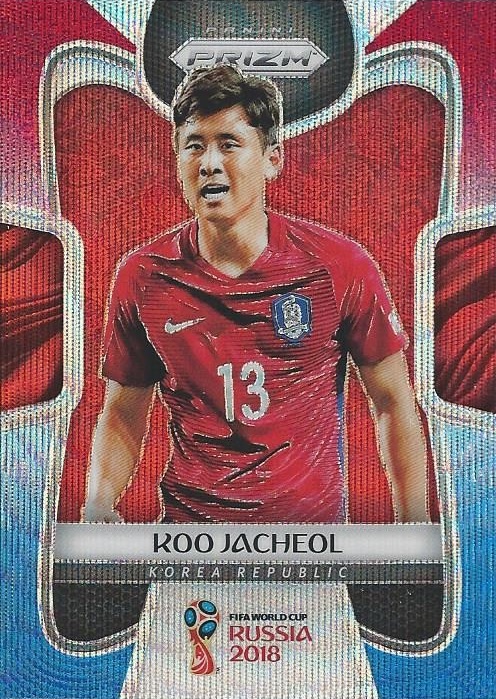 A fantastic card that will look just great in my random soccer binder. 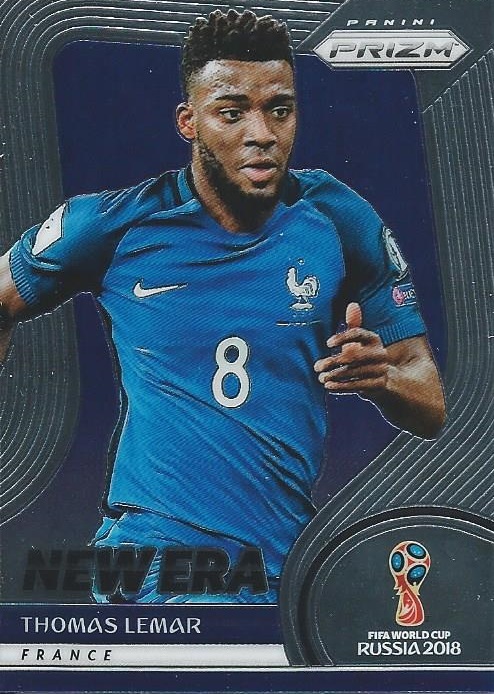 Here's my lone insert, a "New Era" Thomas Lemar. Lemar rode the pine for France in their opener. 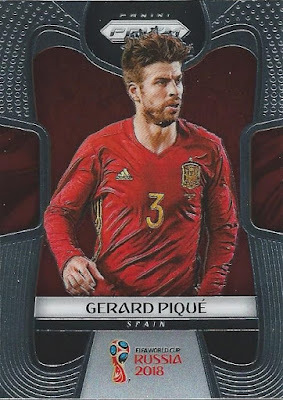 A nice enough card, but I'd have preferred another base, or even more so another shiny parallel. 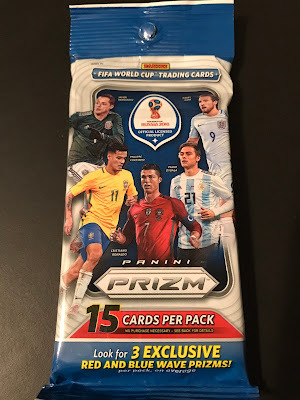 It's a Brazil hot-pack! 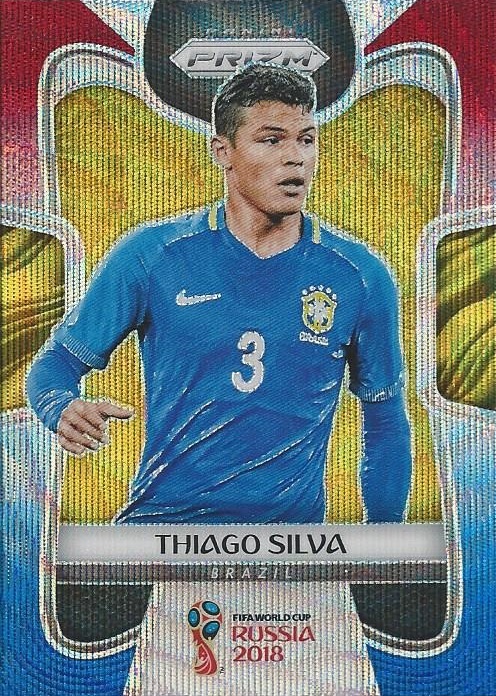 Silva plays for one of the top teams in France, Paris Saint-Germain. He's also with Brazil's team over in Russia, and like Willian was on the field for the entirety of the opener. 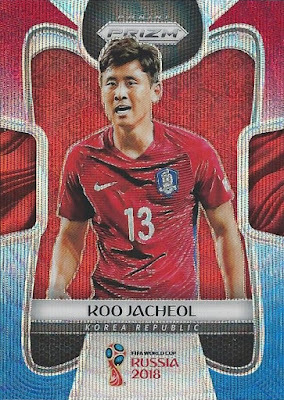 I don't know the first thing about Koo Ja-cheol, but it looks like he's been with the Korea Republic national team for over a decade, and was even captain for a stretch. These Red and Blue Wave cards look just fantastic in hand. I'll hopefully be scooping up some more of them on COMC in the coming weeks and months. Last card in the pack, Mathew Leckie of Australia. 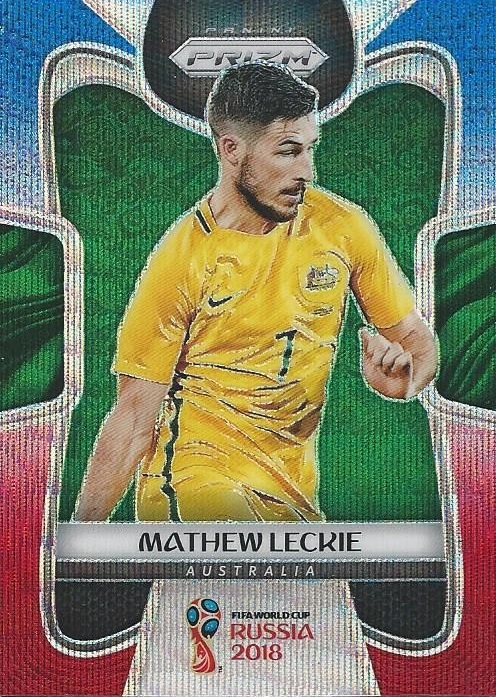 Mathew registered a shot and a yellow card in the first half of Australia's 2-1 loss to France. Well, that wraps it up. That was a very enjoyable rip, and to me was worth every bit of the $9.99 price tag. I think I got incredibly lucky though, and with a different grouping of cards I could've easily come out of this with buyer's remorse. If these were $4.99 or even $5.99 I'd probably be gobbling them up, but at ten bucks I think I'll stick to plucking singles off COMC. So, have you watched any of the action thus far, or do you plan to? 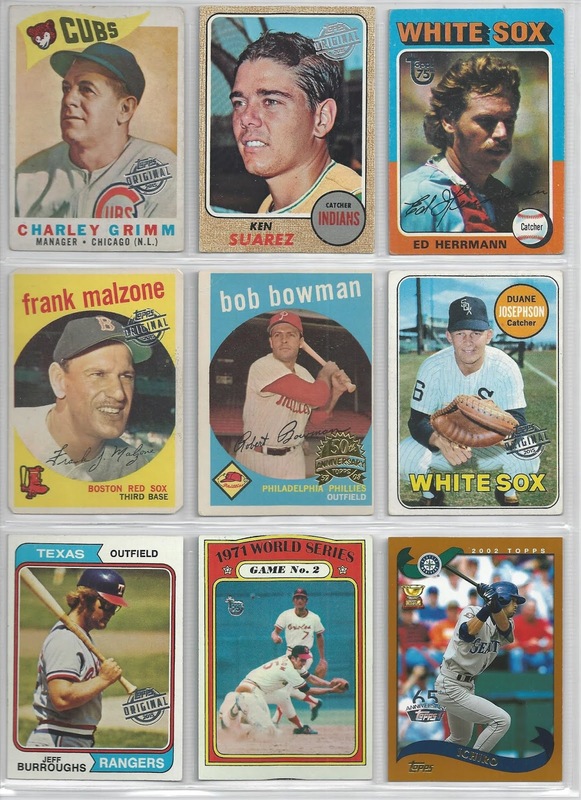 If you're a fan of the game, have you picked any of these cards up, and would you if you saw them in your local big box store?